December 1900. Forming temporary dams in West channel. June 1901. Erecting cast iron lining for sluices. December 1901. Dam from West bank, looking East. April 1901. 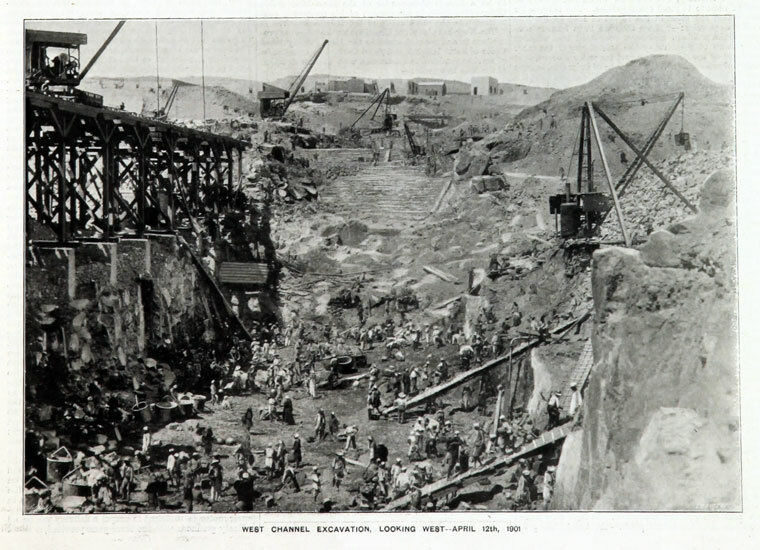 West channel excavations, looking West. May 1902. South side of dam from West bank. See also Aswan Dam and Aswan High Dam. 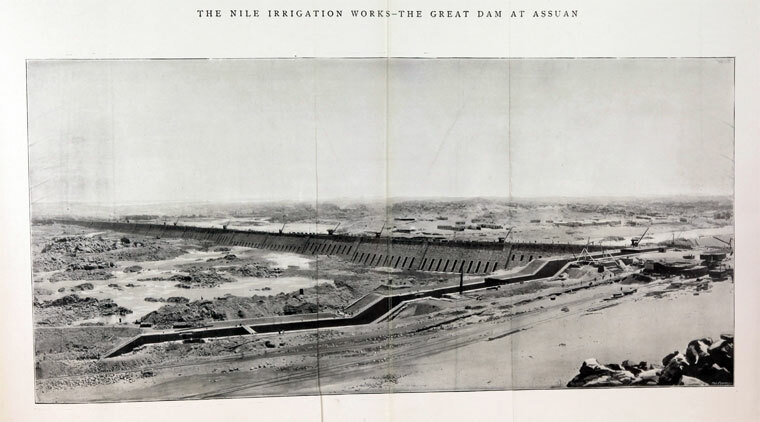 1898 The British began construction of the first dam across the Nile. The project was designed by Sir William Willcocks and involved several eminent engineers of the time, including Sir Benjamin Baker and Sir John Aird, whose firm, John Aird and Co., was the main contractor. Capital and financing were furnished by Ernest Cassel. 1902 December 10th. The dam was opened by HRH the Duke of Connaught and Strathearn. 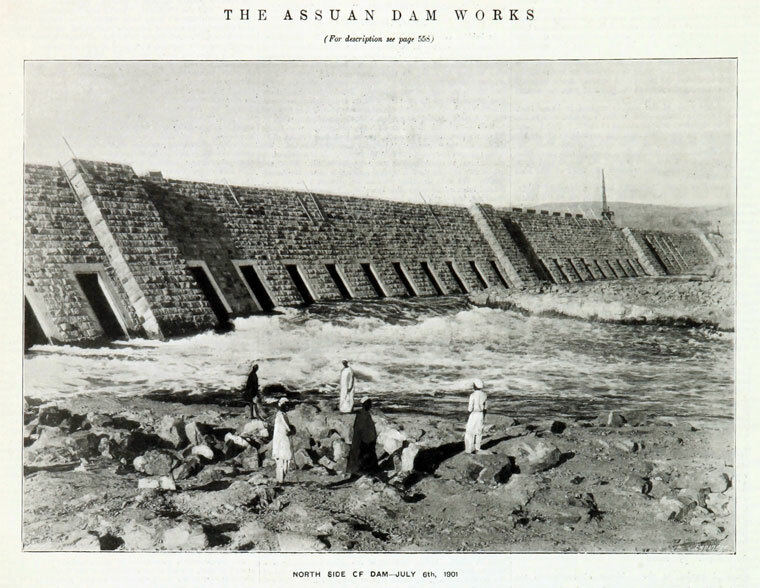 The Old Aswan Dam was designed as a gravity-buttress dam; the buttress sections accommodate numerous gates, which were opened yearly to pass the flood and its nutrient-rich sediments, but without retaining any yearly storage. 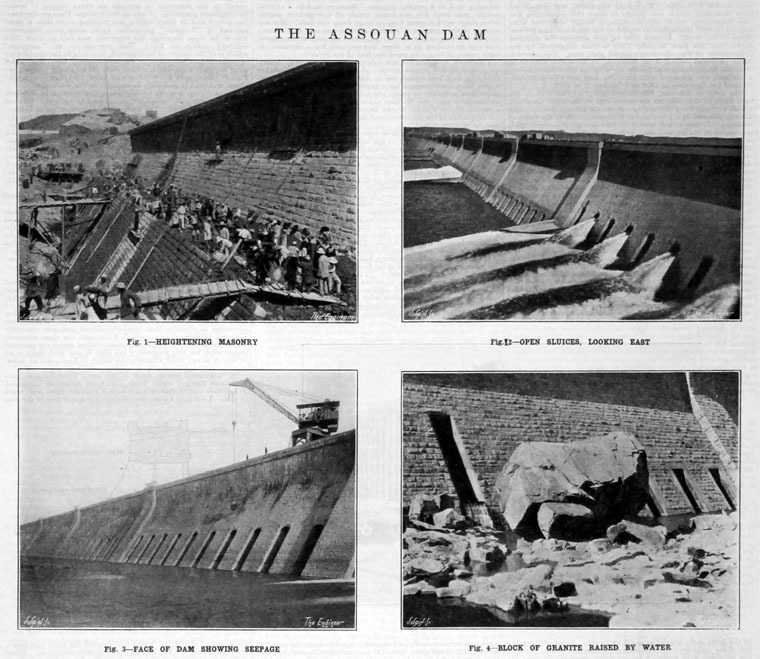 The dam was constructed of rubble masonry and faced with red ashlar granite. 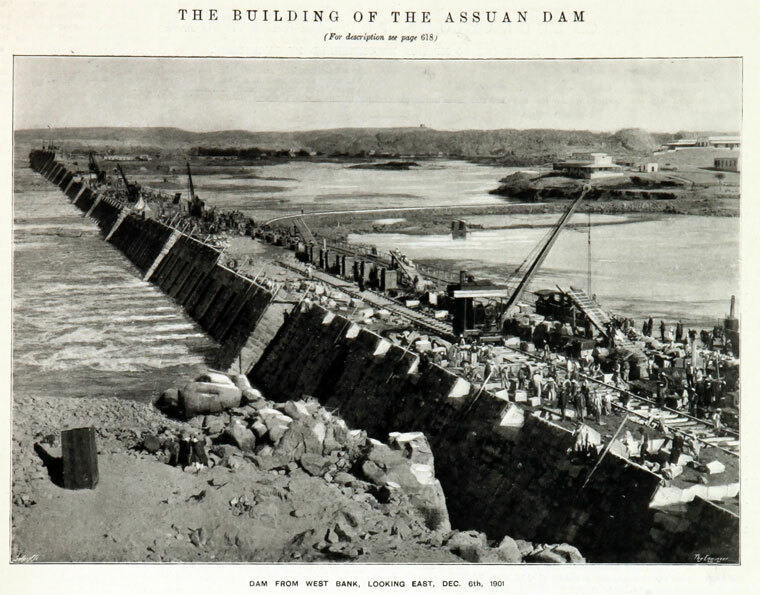 When constructed, the Old Aswan Dam was the largest masonry dam in the world. The design also included a navigation lock of similar construction on the western bank, which allowed shipping to pass upstream as far as the second cataract, whereas a portage overland was previously required. At the time of its construction, nothing of such scale had ever been attempted. 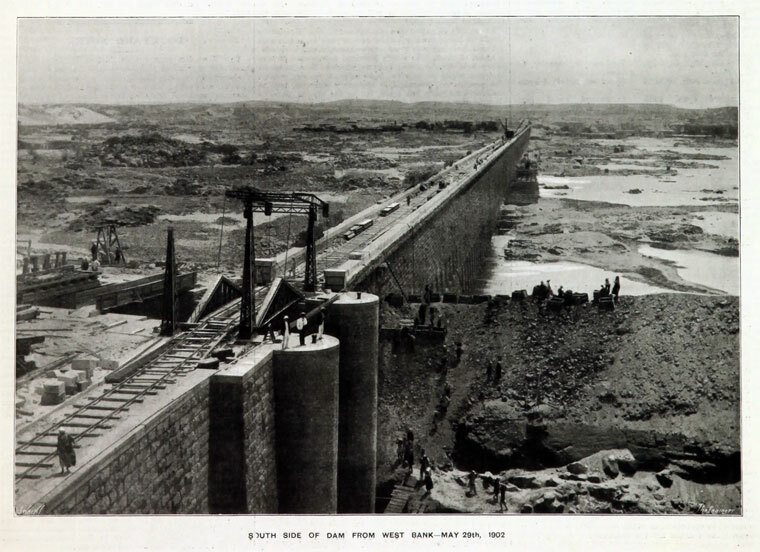 Despite initial limitations imposed on its height, due to concern for the Philae Temple, the initial construction was soon found to be inadequate for development needs, and the height of the dam was raised in two phases, 5 metres between 1907–1912 and 9 metres between 1929–1933, and generation of electricity was added. With its final raising, the dam is 1,950 metres in length, with a crest level 36 metres above the original riverbed; the dam provides the main route for traffic between the city and the airport. 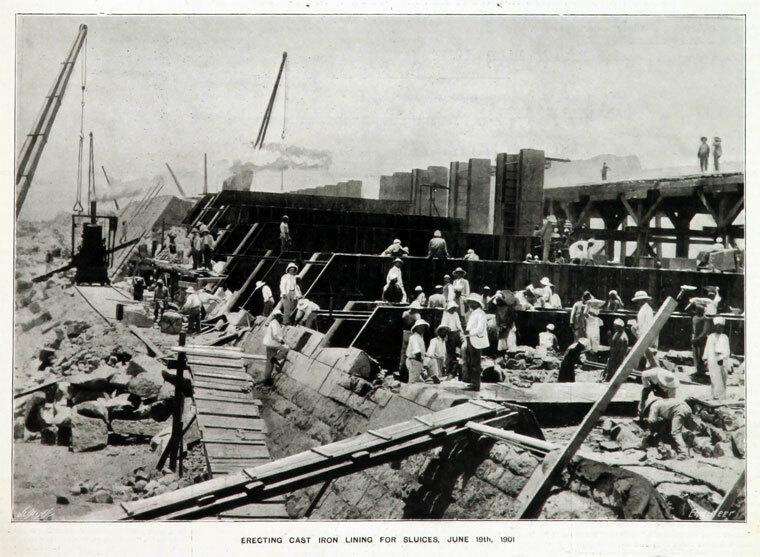 With the construction of the High Dam upstream, the Old Dam's ability to pass the flood's sediments was lost, as was the serviceability provided by the locks. The previous Old Dam reservoir level was also lowered and now provides control of tailwater for the High Dam. 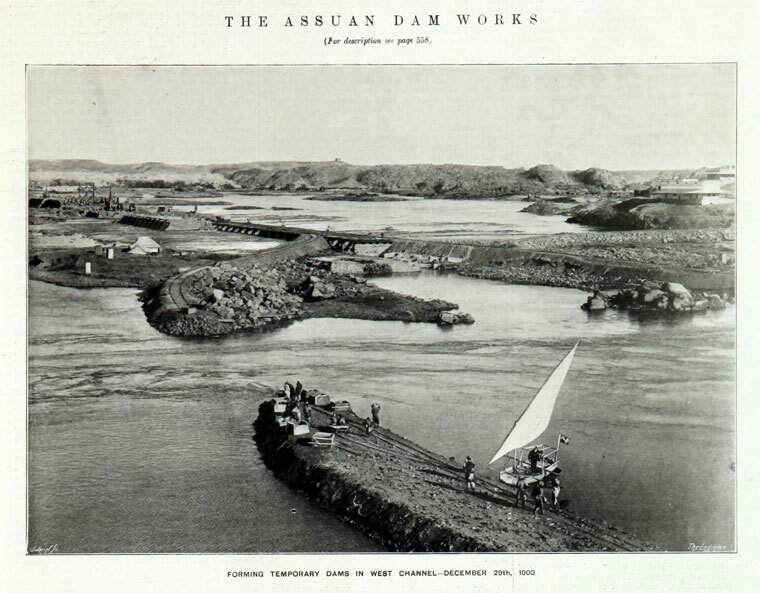 The Aswan Low Dam supports two hydroelectric power plants, Aswan I (1960) and Aswan II (1985–1986). Aswan I contains 7 X 40 MW generators with Kaplan turbines for a combined capacity of 280 MW and is located west of the dam. Aswan II contains 4 x 67.5 MW generators for an installed capacity of 270 MW and is located at the toe of the dam. John Aird and Co were the main contractors. Ransomes and Rapier were the main steelwork and ironwork contractors. P. and W. MacLellan supplied steel sluice gates. This page was last edited on 24 January 2018, at 13:36.